FRANKFURT (Reuters) - German carmaker Volkswagen <VOWG_p.DE> is planning to tighten spending sharply as it deals with fall-out from its diesel emissions cheating scandal, Automobilwoche reported on Saturday. Chief executive Matthias Mueller in an internal meeting demanded that material costs and overheads be cut by 10 percent as part of its annual budget round for 2017, the trade magazine said in abstracts ahead of full publication on Oct. 17. 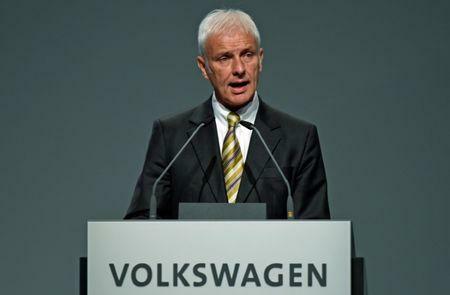 A Volkswagen spokesman declined to comment on the report. Mueller was quoted as saying of the savings: "They will be heavy and it won't be done without pain. The effects of this crisis in the coming years will go to the limits of what we can bear." He also said this was happening at a time when ideally the company should spend its money on dealing with the structural change in the automotive industry. The diesel emissions scandal is costing the company billions of euros and has prompted ongoing talks between management and employees on a cost-cutting deal for the core VW brand. VW's supervisory board is scheduled to meet on Nov. 18 to approve new spending targets on products, plant and equipment for the coming years, two company sources have said.